deck. Comfortable accomodation. 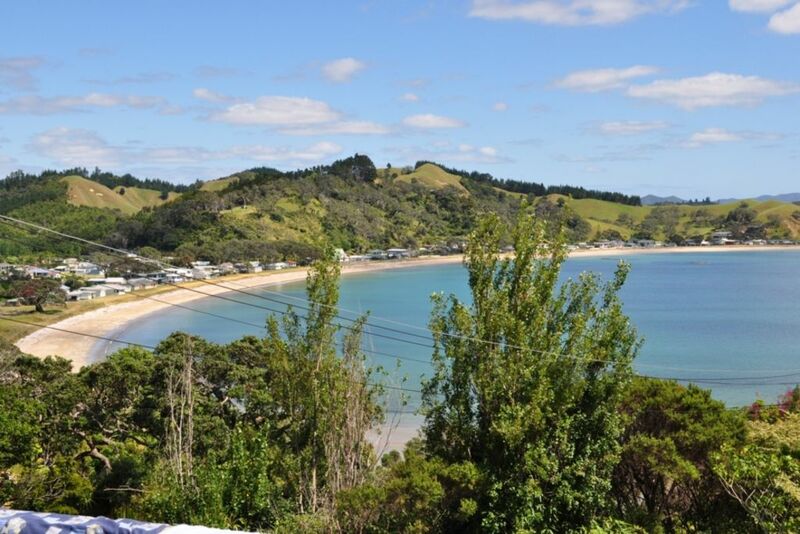 Easy walk down to the crescent-shaped beach, Swimming suitable for all ages, safe for small children, some shade under the pohutakawa tree. Private setting. Pot belly stove for winter time. Lawn and garden with banana palms and fruit trees. Prices listed vary according to the number of people staying and time of the year. Instructions were excellent, thank you, and our host was very prompt in replying. The batch living room and bedroom furniture is very tired, springs coming out of the upholstery in one chair, and I needed to wash most of the cooking and eating utensils before using as they were a bit dirty/greasy. All equipment worked. I was not expecting a roofing person to be at the property, (nor was he expecting us) but he left after a couple of hours. The shower is significantly temperamental in both water pressure and temperature (I was warned regarding this). We did not have young children with us but it was good to see some toys in the living room. I was glad we were told to explore to the end of the road and look for Mermaid Pools. Fantastic location . Just what we needed for a quiet getaway for relaxing, swimming and enjoying this incredible bay. Glad you enjoyed it and all was well after the little hiccup! I am heading there today and have guests arriving from Germany on Wednesday - it is a busy time of the year. This place was great for a cheap and easy get away. Paradise views, a great place to get away from everything and just relax. Thanks, glad you enjoyed it - you will always remember it for its place in your lives. Happy to be part of that. Love the views and proximity to the beach. The bach was comfortable and quaintly retro. Great Kiwi Bach, very much enjoyed our stay.